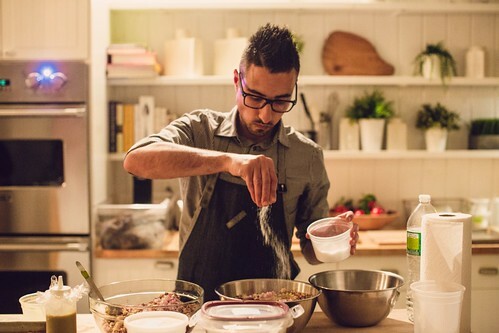 I found myself in the midst of an elite crowd of some of New York’s most fashionable, sipping mojitos, and chatting animatedly in anticipation of the sumptuous treats that Top Chef contestant, Michael Patlazhan was preparing. 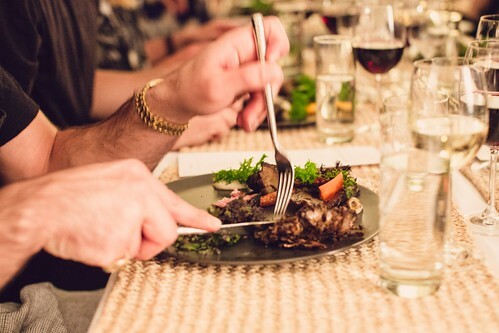 There was an air of mystery stirred into the atmosphere, and as dinner guests mingled, watching Chef Patlazhan’s masterful technique on full display in the open kitchen, they wondered what the occasion might be for this exclusive dinner event that all had been invited to. 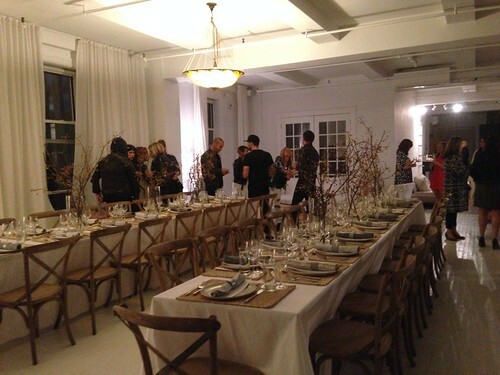 Not that anyone is going to stare too askance at the opportunity to spend a Monday evening at an impeccably decorated Flatiron district loft eating positively dreamy food—but this group had no idea who their real host was and what the impetus of the illustrious gathering. As we seated ourselves at the elegantly decorated table, the first course appeared along with Chef Patlazhan to present and describe his stunning creation. 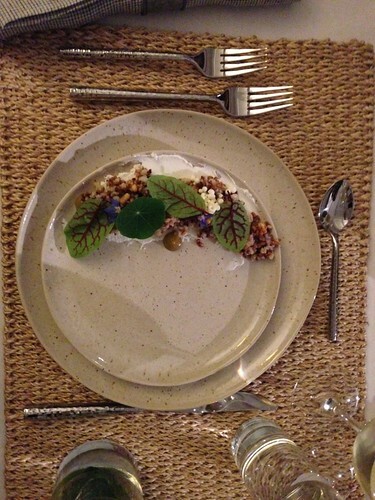 The three preparations of ancient grains gracefully arched across our plates, dazzled with edible flours and molecular “pearls” of vinaigrette, resting luxuriously atop a velvet swirl of labneh (an intensely creamy, strained Greek-style yogurt). The complex play of flavour and textures wowed every single palate, and a ripple of happy sighs seemed to pass throughout the loft. And then, as we all felt ourselves letting go to full indulgence, the big reveal: the host of this party was none other than Weight Watchers. The brand, associated with those wishing to lose a few pounds (or more than a few), is not the first one you might think of when you think of a decadent, indulgent meal and an incredibly stylish crowd and loft (despite its solid reputation for decades of success stories). And that was exactly the point of this evening’s affair – to show that Weight Watchers not only breaks the mold of a dated, “calorie-counting” movement, it does so with cutting edge flair and ultra hot results, and never a feeling of deprivation. The wow’s that the revelation inspired among the dinner guests was a true testament to the misconceptions of Weight Watchers. And that night, we all learned that being healthy, whether maintaining a svelte physique or attaining one, is actually something that can seamlessly fit into the erratic, indulgent life of a fashionable New Yorker. In fact, it is something that could very likely enhance it. Still skeptical? We’ve been lucky enough to have Weight Watchers share the recipes that Chef Patlazhan created for the night. See below for recipe inspiration! 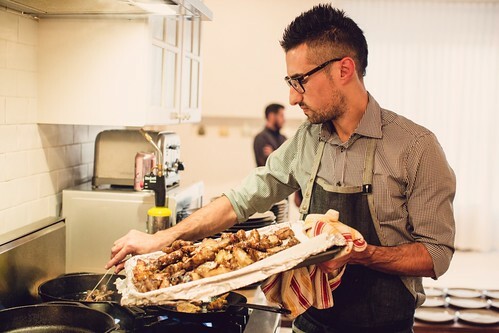 Photos of Michael Patlazhan and kitchen by Diana Levine. Additional photos by Ava Fedorov for Socially Superlative. Quinoa: bring 2 cups water to boil. Add 1 cup quinoa and salt. Cover and simmer for 15 to 20 min. Barley: bring 3 cups water to boil. Add 1 cup barley and salt. Cover and simmer for 30 min. Bulgur Wheat: bring 2 cups water to boil. Add 1 cup quinoa and salt. Cover and simmer for 15 to 20 min. Farro: bring 3 cups water to boil. Add 1 cup farro and salt. Cover and simmer for 45 to 60 min. Dehydrate quinoa, barley, farro, bulgur wheat and wheat berries for 6 to 8 hours till crispy. Puff grains: Add oil to a pan and get it hot. 2 to 3 minutes. Add dry grains and puff them up 15 to 30 seconds. Drain and season with salt. Put yogurt into a double cheesecloth and compress between hotel pans with a strainer inside and leave to drain over night. Score tomatoes. Bring salted water to boil add tomatoes for 15 to 30 seconds until skin starts to come off. Take tomatoes out and blanch in ice water. Once cooled drain and peel skin off. Season with salt, sugar and blood orange juice. Dehydrate till consistency of a dried raisin. 6 to 8 hours. Place the raisins in a bowl. Pour hot water over the raisins and bloom at room temperature until they are soft, 2 hours. Drain, discarding the water. Puree in a blender until smooth, slowly incorporating the Curry Oil with the blender running. Season with the salt. Heat 1 cup of the oil in a medium sauce-pan over low heat. Add the apple, onion, and lemongrass, sweating until translucent, without caramelizing, about 5 minutes. Add the curry powder and lightly toast with the vegetables for 2 minutes . Add the remaining oil and the kaffir lime leaf and heat the oil to 160°F. Remove from the heat, cover, and steep for 20 minutes. Strain through a coffee filter. In a mixing bowl, whisk together the Lemon Oil and lemon juice. Season with the salt. Freeze in squeeze bottle. Plate – add Labne to plate, add mixed grain mixture and tomato raisins, dot plate with raisin pure and lemon vinaigrette. Dress with edible flowers. Make marinade: combine water, soy sauce, pear and apple juices, mirin, sesame oil, sugar, pepper, onion, carrot, scallions, and garlic in a large pot and bring to a boil over high eat. Reduce heat so liquid simmers gently and cook for 15 min. Strain solids out of the marinade and cool in refrigerator (can be stored, covered, for a few days). Sear ribs in pan to brown each side. Cut Sunchokes in half leaving on the skin. Toss with olive oil, salt and pepper. Roast with thyme, lemon thyme, garlic cloves at 375 until golden brown soft. 30 to 45 min. Using a mandolin slice Sunchokes into thin sheets. Then bring pickling liquid to a boil and pour over Sunchokes. Let rest in the fridge overnight. 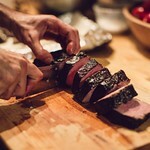 Place short rib on plate with sunchokes (roasted and pickled). Put remaining ingredients in a food processor, and add cooled chocolate mixture. Blend until completely smooth.